QBAG is described as the latest 'must-have product' for dining alfresco or for everyday cooking as QBAG also works perfectly as an oven-cook bag. QBAG is a disposable foil cooking bag designed for keeping meat, chicken, fish and vegetables juicy and succulent. The QBAG locks in flavour without burning or overcooking food and also helps with cleanup by keeping the BBQ grill and oven tray clean. During cooking time the food is visible to the 'chef' and expands to provide a pressure-cooking 'chamber' whilst automatically self-venting for pressure and steam to escape safely. The window may be peeled back during cooking to stir, or it can be peeled off completely for food to brown and crisp up, creating a serving vessel. QBAG allows foods with small pieces such as prawns or sauced product to be steamed perfectly on the BBQ. Succulent flaky fish, salmon teriyaki in under 20 minutes. Fluffy potatoes with or without skin. Keep left-over Sunday roast lamb/beef moist and juicy for the next day. QBAG can be used to segregate meat, fish and chicken from vegetables, without any transfer of flavours or lingering odours indoors or out! 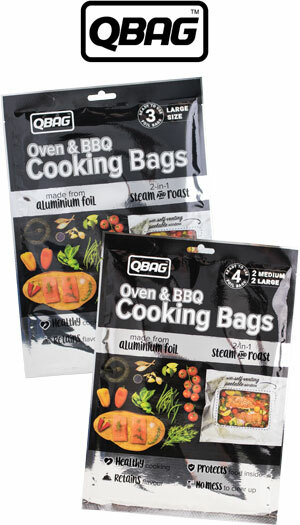 QBAG will protect food in the bag from burning or charring on the BBQ or in the oven. Smoke from the charcoal can still infuse with the food inside once the window film has been fully removed. With the BBQ/grill hood closed, the flavour can be enhanced without the mess. QBAG allows you to create and develop exciting new dishes that may not normally be associated with BBQ or outdoor cooking. Even use them for camping! The dead-fold characteristics of the foil keep the bag closed once the bag top is folded.